"A highly customization listening and analytics platform"
Brandwatch as a platform is highly useful on its own. After having a few dashboards built out by the customer support team you will immediately start to benefit from Brandwatch's versatility and many filtering settings. Where Brandwatch really starts to shine is when users begin to really get to understand the platform and start building out their own custom dashboards, rules, and tools. This platform pays off exponentially as users learn how to customize it's tools to suite specific needs. Compared to other listening platforms we've used in the past, Brandwatch has a much higher payoff for mastery which makes any time invested in the platform feel more valuable than just the data and insights gained. Brandwatch certainly has a more intense skill curve than most other analytics/listening platforms. The richness of data is greater than other platforms, but it does take a real time investment to get those deeper results. Reach out and get a demonstration. The product specialists that demonstrate the product know a great deal about the product and do an excellent job of showing the potential Brandwatch has for your your brand. We use Brandwatch for general brand sentiment analysis, tracking deliverables from partners and affiliates, managing online brand voice, product sentiment analysis, and Brand social analytics. "Review after 6 Years and Ongoing Relationship"
Nothing, just some features already in the market, and Brandwatch release that features a bit late, but I saw that in 6 years, they want it to be perfect. So they may be late to add features which are already in the market, but when they release it, it is perfect. They add new features for your need, they are fast. Their interface is so easy to use. If you have to add sentiment/category manually, Brandwatch's interface will help you a lot. Dashboards are customizable, you can add your charts like a powerpoint slide. In 6 years, I have tried other global tools like Netbase, Sysomos, Synthesio, NUVI etc. But all these 6 years I decide to move on with Brandwatch. I have used Brandwatch at GroupM for regular reporting to our clients, daily weeky and monthly. I have used Brandwatch for our agencies annual client strategies and provide them insights for their new projects. I have used Brandwatch Vizia for our clients' big events. I have used Brandwatch alerts/signals to know the opportunities and also crisis. "Best social intelligence tool, but also the best partners to support your business needs"
I'm a huge fan of Brandwatch's capabilities of going deep into the research, filtering noise from the queries but also keeping in mind the usability and processes that the regular analyst goes through to uncover insights. The tool is adaptable, fast and very thorough. As most of the tools, sometimes Brandwatch goes through instabilities to update queries or even load the dashboards. They fix it very fast though. Working for a Global Technology Business, I can tell you that we went through a very complex RFP process to select Brandwatch. They were the most capable vendor, both in terms of supporting an enterprise with a great platform, but also from a people perspective. Brandwatch's team is always there to support us and we see them as partners of our business - they are constantly looking for opportunties to improve and help us accelerate and achieve our goals. Brandwatch allows us to connnect with the true voice of our customers in social media, getting a pulse of what's trending and the sentiment they have in regards to our brand. Also, from a sales perspective, we can assess a lot of opportunities and get insights from our top customers via Social Media Monitoring. "Great tool and great partner"
Having worked in Social Listening for the past 10 years, and having tested and used all the main tools out there, I can say that Brandwatch is absolutely among the best tools you could choose for social media intelligence. I have used Brandwatch since 2016, every year I evaluate how it compares with the other players in the industry and so far Brandwatch has always proven to be the best choice for our needs. -	User-friendly interface: from setting queries up to analysis of data, Brandwatch Analytics is very easy to use and intuitive. You don’t need to be an expert to create a query or setting up a dashboard. -	Advanced features: if you are an expert you’ll find a very flexible query builder with pretty much all the operators you need, lots of metadata to filter your data and several options to automate tagging and classification of mentions. -	Data visualization: Brandwatch offers several pre-built dashboard templates but you can also create your own dashboards and templates combining an always increasing set of charts and components. -	Alerts & Signals: it’s a feature that might be taken for granted but not all tools provide the necessary flexibility . With Brandwatch you can decide to be alerted whenever a product or event is mentioned, or only if the mention comes from relevant authors or sources. Moreover Signals will alert you on any change in your data set (a peak in volume, an increase of negative mentions, a particularly retweeted author or hashtag). - Vizia: Brandwatch Vizia has been very useful to help us foster the data culture inside the company and bring real-time insights to the different teams. - Customer service: from customer success to sales and product teams I've always felt that they are very dedicated in helping us make the most of the tools and really interested in knowing how to help and improve. -	Prevent, monitor and manage potential issues and crisis. "Acceso a la información de forma fácil y rápido"
Lo que más me gusta es que puedo identificar tendencias en la conversación, conocer un poco más sobre las personas y saber como viven su día a día. No necesito sentarme con ellos para saber que les gusta o que no y lo puedo llevar a ámbitos laborales haciendo zoom a la conversación de marcas o categorías. Me gustaría poder categorizar la información por rangos de edad, creo que esto seria un plus inmenso. También poder tener la data de facebook ya que en mi país es la red social de mayor interés " aunque entiendo las limitantes de la misma". Brandwatch nos permite hacer seguimiento constante de las diferentes categorías de productos que manejamos en la agencia, lo que nos permite tener un plus con los clientes. Así mismo nos permite hacer seguimientos de campañas puntuales y hacer modificaciones en cuanto a contenidos, teniendo en cuenta la reacción del publico en tiempo real. "The best in social listening"
Brandwatch is truly second to none when it comes to social listening. I particularly love the ease of building Boolean queries, access to our account rep and the amount of data at our fingertips. Wish there was a quick widget to show total impressions/reach for the summary dashboard. Currently have to export data and calculate by hand. But that's not a major issue at all. Only other thing is the ability to TRULY share dashboards. We have one that often requires data cleansing (by nature - it's a very broad topic that can only be narrowed down so far), and I need my team to be able to go in and cleanse it on their own. Problem is that the data can only be deleted and saved using my account since I'm the dashboard owner. People with analyst access should be able to more freely manipulate things. Definitely try to attend the DYK conference!! Learned SO much and was great to connect with the Brandwatch team and other users. We're able to quickly and efficiently pull social insights, but we've also used Brandwatch to set up super customized alerts for clients dealing with crises or long-term issues. The ability to provide reports on both earned and owned is fantastic, and it's so easy to get up and running, allowing us to even pull insights for new business or visibility purposes on a dime. "Experience with Brandwatch over the last 6 months "
I have been working extensively with Brandwatch over the last 6 months for social media monitoring and live data visualization (Vizia).. The social listening capabilities are powerful, the data pulled through is relevant and easy to digest. It's a good platform to use both for more advanced users and absolute beginners. The interface is user-friendly and setting up dashboards/queries quick and simple. It's a great way to get quick, live insights into online conversation around your brand. Sentiment analysis is hit and miss, as the platform struggles to pick up sarcasm and seems to associate certain words and phrases with positive/negative sentiment automatically, irrespective of context. In audiences, more 'advanced' style setting should be made available to the user to allow more sophisticated segmentation. This is not a dislike, I know it is a work in progress, but I also look forward to seeing more tiles/elements added within Vizia to allow even more integration with third party software. We are much more aware of daily volumes (mentions), sentiment, audience breakdown on Twitter. Vizia has been useful for bringing our work to life and showcasing it around the office. People really do stop and look at the screen! "I couldn't do my job without them"
I've been a social media analyst for a decade and Brandwatch is the only tool that allows me to have complete flexibility and control of how the data is organised. It is superior to all other social listening tools in that respect. It's also miles ahead on innovation and giving beta access to clients. Influencer analysis and campaign analysis in particular are brilliant with Brandwatch. The rules function for creating auto-tagging and categories is really useful. We use these across all of our products and services to keep the data clear and organised. I would love for everything to be included in my contract rather than having to bolt on additional products, services, and conference tickets, but I can see why this isn't done. I don't like our current data cap either which doesn't allow us to track everything we'd want to. It would be great to be able to track major sporting events like The Olympics without having to worry about filtering it down to fit under the cap. Get full trial access to the tools and know from the start what you want to know to do your job well. Brand reputation, benchmarking, campaign monitoring. I've realised that out-of-the-box sentiment tracking isn't great for our brand, so Brandwatch is helping us to create bespoke sentiment rules. We can also easily benchmark across a wide range of topics using auto rules and tagging/categories within Groups. I´ve used Brandwatch since 2014. Every year I compare Brandwatch with others social intelligence platforms and every year Brandwach is the best platform for our agency. 1. Easy to set up --> Is pretty easy to set up a project. It´s not necesary have advanced knowledge to set up a query. 2. Once the query is actived is really easy work with the data, specially when there are million of mentions. 4. UX --> This is the key of Brandwatch, even when a query has a millions and millions of mentions with one clic is possible make a drill down and understand the context. 5. And finally the custome service --> I have an excellent account manager who is really commited to help us to grow. 1. Brandwatch has few templates of data visualization and also is possible create a template from blank, but I would like more templates with new ideas to analyse the data. The price is hight because the price model is based in number of mentions. "Brandwatch is THE social listening tool"
I've been using Brandwatch for nearly two years now and it's undoubtedly the best social listening tool I've ever used. Despite being the leader in this space, Brandwatch hasn't taken it's foot off the pedal - continually expanding functionalities and adding new features. It really seems like they value the feedback provided to them and use it to help shape the product. I also love how manipulatable the tool is. While many tools out there provide a handful of ways to visualize the data, Brandwatch offers, what seems like, an endless amount of ways to segment the data. The filters available allow for the most granular perspective, which has provided my team with some of the most valuable insights. The customer service we've received has been spectacular. As mentioned above, they truly act on the feedback we provide. The manager on our account is incredible - always responding with an answer or resolution in a timely manner. It feels more like a partnership rather than a vendor-client relationship. Anything that hasn't matched their standard has been dealt with. However, I would like to see some improvement made within the sentiment measurement. Obviously a hard task to be 100% accurate when dealing with natural language processing, but I think there's definitely some room for improvement. Also, when dealing with a query that's pulling in a lot of chatter (e.g. 1M mentions per month), you need to take a sample of the conversation, which still can take a pretty long time to run. Overall though, queries are processed very quick. We use Brandwatch to uncover trends in topic areas that then assist with the development of content for our properties. Additionally, Brandwatch helps us monitor the conversation around the brands we work with so we can properly respond to RFPs. "¡Mi experiencia con Brandwatch! 🤔"
% de menciones, pero con BW y menciones ilimitadas ¡YA NO PASA! . Las cuentas con más de 3 millones de followers no las puedo agregar yo misma 🙄 aquí entra soporte a solucionarlo pero seria más fácil y rápido que lo pueda hacer desde mi usuario. Prueben la atención, prueben dando un caso de ejemplo para que vean lo que puede hacer la herramienta para ustedes, en mi caso use otra plataforma naranja con azul y me resulto complicado su entendimiento y el alcance que puede tener. Monitorear a la competencia es esencial en el día a día, los influenciadores que apoyen en el crecimiento de la marca también, Brandwatch te permite tener toda esa información en un solo dashboard y ver realmente el alcance que tuvo esa campaña. "Excellent tool, GREAT team and big solutions"
What I like most about Brandwacth is that it is simple and easy to use but with great results, allowing us to understand audiences, the perception of brands and many other things. The most interesting thing about this type of tool is that everyone can use it but the analysis and the use that will give the information will depend on the focus of the agency, for this it is very important to be aligned with the Account Manager to help us to reach our goals through the tool, Andres Velasquez has been a great support for the Raya team. Let's go for more! Until now, I have no problem with the tool, if I would like to have regional reports more frequently. It helps us to understand different audiences, detect opportunities in the category, communicational or commercial. In addition, it is the perfect ally to detect crises at the moment to react effectively. Easy to use interface. Dazzling and snappy help. Quick, boolean administrators. Top of the line adaptable dashboards. The apparatus is versatile, quick and exceptionally careful. The lavishness of information is more prominent than different stages, yet it takes a constant venture to get those more profound outcomes. Certainly attempt to go to the DYK gathering!! Adapted SO much and was extraordinary to interface with the Brandwatch group and different clients. Get full preliminary access to the apparatuses and know from the begin what you need to know to carry out your responsibility well. Brandwatch is coming out on top in social tuning in and social insight. Extraordinary item, incredible individuals, proceeded with development, the majority of this equivalents achievement! Interface with the genuine voice of our clients in online life, getting a beat of what's drifting and the opinion they have concerning our image. Additionally, from a business point of view, we can survey a great deal of chances and get bits of knowledge from our best clients by means of Social Media Monitoring. Screen and measure showcasing efforts. Measure brand wellbeing. Check influencers and tributes notoriety. Discover motivation for substance creation (new patterns, purchasers questions and concerns, and so forth). Drive advancement and item improvement. Break down the challenge. Avoid, screen and oversee potential issues and emergency. "Powerful DIY Social Listening Tool"
Brandwatch is a very powerful social listening tool, and getting better all of the time. The breadth of the data it captures is impressive, and you are only limited in the tool by your own knowledge of how to use the system. Therefore, if you know how to create smart, tightly structured queries, how to create smart rules to help save manual search and filing, already have a set of keywords to plug in to your query, and know how to use the more advanced chart visualizations beyond the stock ones they provide, you should be in great shape. The range of historical data, as well as the ability to access it in detail is a definite plus that puts them above competitors if you're looking for long-term historical trends. As my likes may have hinted, if you've never used a social listening tool, there's a steep learning curve. Don't get me wrong, their customer service/account management is fantastic-- they take you through an initial training and are happy to answer any questions you have, but it's hard to articulate what you don't know, just starting out, so there's things I'm only learning how to do after a year of using the tool. I like to think of it as a very power shell/big data source. If you know exactly what data you're looking for and already have the necessary keywords to build a query, you can do great things. If not, it will be an uphill struggle at times. Many of its competitors have "quick search" type functions that are great for new business pitches or other situations where you're starting from square 1, while Brandwatch does not. Visualizations are serviceable, they are quite basic don't allow flexibility, so many times I end up exporting the data and creating my own in other tools. Author/Influencer identification is an area that needs a lot of work. Its system is easily fooled by Twitter spam. When I used the same query and compared against its competitors, most of its competitors found the right authors/influencers for a topic, with much less spam accounts in the mix. It seems Brandwatch relies too heavily on Klout scores and other systems easy to cheat by bots. I also spend a fair amount of time re-categorizing mis-filed sentiment markings. Mention limits can be frustrating, especially since they are one of the only competitors that have a mention limit and use that as the basis for charging. Brandwatch is a great tool for social listening, especially if you already have experience with query building (using Boolean logic, are familiar with Operators, etc. ), but sometimes things feel like they're harder than they need to be. Considering it's one of the most expensive products in its category, I would expect more features and functionality right out of the box, and to be far less DIY. And the product keeps adding new features all the time, so I think they're on the right track and only getting better, but still have some gaps. If you're using it to monitor your brand's social presence only, or if you're in an agency and using it to monitor existing clients and provide reports to them, then this is a great tool and you're hard-pressed to find something better. But if you're wanting it more for new business and discovery, there are tools that do this much better, including Sysomos and Crimson Hexagon. Brandwatch allows our company to do social listening for both existing clients, as well as for research on new business pitches. We've been able to provide clients and our sales team with vital info, such as share of voice, brand sentiment, as well as verbatims from customers and potential customers. It's important for a company and agencies to utilize social listening tools to make informed business decisions! "Brandwatch simplifies the process of aggregating and displaying social intelligence." I love how Brandwatch continues to improve and evolve almost weekly. It has become more simplified, yet robust at the same time. From analytics to Visual Intelligence Brandwatch holds the bar very high when compared to competitors in the industry. I've been active in all levels of social listening to social intelligence over the last 10 years. Having used multiple social listening technologies, Brandwatch is far superior to the others. I dislike nothing about the technology, perhaps it's this question? Brandwatch is leading the industry in social listening and social intelligence. Great product, great people, continued growth, all of this equals success! I personally am working on a high priority project blending Social Voice of The Customer and Social NPS with internal programs. The results thus far have been spectacular. 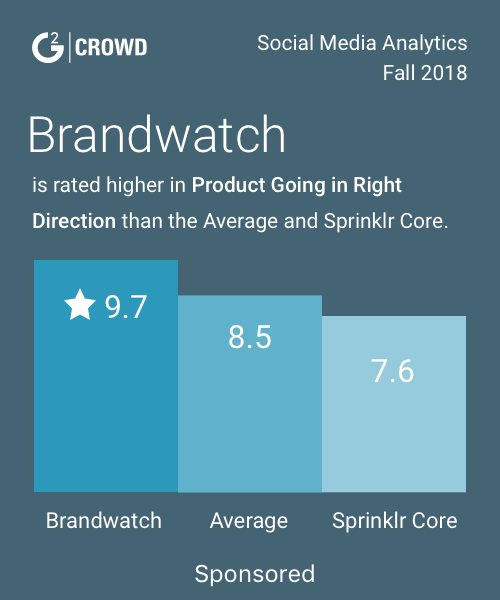 "One of the best social listening tools for analytically minded users"
Brandwatch's has a very friendly user interface with robust functionalities. I particularly like the way you can segment data (manually and automatically) using their Categories and Tags. I like the pre-set and customizable dashboards. My community management team relies on the Alerts functionality to stay current on trending conversations and potential crises. Their data coverage is on-par with other social listening tools, though I really wish we were given better Facebook/Instagram data coverage. The new way in which they collect data from these platforms is dependent on the number of users who authenticate their profiles through the platform -- so small companies like mine are disadvantaged. We successfully use Brandwatch across various departments/functions: Community Management, Social Media Performance, Competitive Audits, and identifying insight for our briefs. It allows us to be smarter about our clients' brands and closer to their social media audiences. "Last year I said I recommend Brandwatch and this year I can say I still really love it!" •	Super responsive service team and sales execs. •	Better insights--further above just listening than many other tools I've tried. •	The social media being mined is extensive, including the entire Twitter firehose and an absolutely huge and continuously growing set of common and uncommon social media sources. •	The querying is super-flexible resulting in more relevant results and the ability to isolate different pieces of your query by proximity within the text. •	Topic clouds are really topic clouds. That is, they mine for phrases instead of just words; ability to track topics over time. •	Brandwatch includes social media and online news as well. I really had to think hard to arrive at something I dislike. I sometimes wish I could see exactly what is being filtered out with the spam filter. I've never seen any spam in the results. I have another wish-for to be able to weight results by usage so Twitter isn't such a beast in my overall look. I supposed it's just a matter of time. Also wish for a larger number of characters available for the queries. Mostly just in case of exclusions for more common terms. I've tried, tested and used a great many of these tools and this at the top for its' completeness. In addition, the innovation team is working on ways to really deliver the future of listening--and fast--with support to back it up. We have been able to create social brand equity and customer experience frameworks that are highly repeatable and standardized. I use Brandwatch everyday to monitor conversations about my products and services. We need this data in order to connect the dots with our marketing efforts and create insights for our strategy teams. It's also a great research tool for planning and the near real-time analysis is crucial for seeing trends and picking up on crisis. The real time alerts are so powerful. We use these for nearly every query we set up. We also use the automated reporting which makes distributing the data a lot easier. I'd have to nitpick here, I don't like that I can't email all of my users easily from the platform. It would be helpful to also have a bit more support around API integration. The written paperwork is great, but sometimes our data analysts need a bit of handholding. "Un verdadero partner estratégico para el negocio"
Luego de analizar las opciones en el mercado, la decisión estaba clara; Brandwatch era la herramienta correcta para integrar a nuestros procesos. ¡Y no nos equivocamos! La plataforma y el gran equipo humano tras ella, se han convertido en un verdadero y valioso partner para BBDO Chile. Por el momento, no hemos tenido ningún problema con la herramienta ni con el equipo que nos apoya constantemente. Nos ha posibilitado agilizar el trabajo y disminuir horas y horas de arduo trabajo. Nos ha ayudado a aumentar la calidad de todas las áreas de nuestra agencia; desde el monitoreo de Social Media, las investigación y estrategias hasta la misma creatividad. Nos ha permitido generar un gran valor para la agencia, y por supuesto, para nuestros clientes. "One Tool. Many Features. Tons of Data. " 1) 100+ million open public data sources; new Lexis-Nexis paid integration brings in pay-walled data. 2) Professional and detail-oriented customer success team. 3) The tools UX was redesigned and looks better than ever; new widgets are helpful, too. 4) Export functionality makes it easy to use the data outside of the tool. 5) Alerts/Signals enhances situational awareness about your data sources or segments. 6) Troubleshooting requests answered swiftly. 7) Their new learning hub makes it easy to on-board new users and continue developing your core users. 8) Product development - The team continues to role out new widgets and updates to the platform. 9) The Brandwatch Now You Know conference gives you an opportunity to connect with the community and expand your horizons about leveraging the tool. 10) Vizia displays designed for open, high-traffic areas look clean, professional, and always evolve to meet the customer's needs. The tool lacks a robust unstructured NLP model feature. This feature requires an additional paid service via a partner vendor. Given the nature of social data semantics, this NLP feature should come standard. Sentiment remains a tricky KPI for the entire industry. Test everything, especially the data loads and time stamps. Visit their annual conference to gain better insight into the platform. Brand reputation monitoring, process improvement, product research, and various other use-cases. Our business partners enjoy the dynamic features and access to broad data-sources used to help answer their business questions. The alerts/signals feature definitely adds value to our core users, although some partners prefer this feature over visiting a previously setup dashboard. "Heavy user for 3 years"
The openness and flexibility of the tool. You have a huge variety to build your own components. The insight examples are also a good help when approaching a new topic. The coverage of sources is huge! Some metrics, like Impact are not transparent enough. In the way it is calculated you cannot compare the Twitter Impact to the Facebook Impact. Some UX things can be improved. A paid-prediction algorithm would be super nice. Social Bakers has that. In general for "social media tool beginners" Brandwatch can be quite complex and overwhelming. The sentiment algorithm is very often just a no-brainer but that's the same with every other tool. Lots of social listening for pitches to analyze and find out discussed topics. Ok overview for channel performance (but there are better tools). The huge benefit is basically that you can do qualitative analyses but using big data as a base. "Great for Social Listening - Just not for Canadian-only Results"
Their support team was really helpful - always. It is pretty user friendly and can provide so much data that can help inform your business decisions. One of the only things I didn't like was that it was difficult to limit results only to Canada. The act of it was simple (writing location as Canada in the query) but results were often missed as it automatically ruled out anyone with "no" listed location on social, thus ruling out a lot of our Canadian results. If Brandwatch could figure out a way around this or identify locations another way, that would be very helpful. I also found it very geared towards Twitter, which is becoming an irrelevant or insignificant platform for a lot of Consumer/Lifestyle Campaigns. Great tool, if you don't have to target your campaigns (and results) to Canada-only. Social listening and influencer identification. What I like most is the ability to craft complex Boolean queries to target exactly the kind of content I'm looking to pull. Only the dashboard creator can delete mentions on any given dashboard. Inconvenient when I have multiple people working on the same project, and only one of us can delete irrelevant mentions, spam, etc. Requires extra work we wouldn't otherwise have to worry about if everyone could delete, and possible issues with deletion could easily be remedied if you could somehow review deleted posts or unhide them. We're able to quickly craft queries and pull online data from far more sources than we could with our previous vendor. The platform has robust historical Twitter data and is also reliable when it comes to public Facebook data, Instagram, forums, YouTube, etc. "A great tool to take decisions based on the share of voice and competitors insights"
With this tool it´s very easy to configure the searches and to reuse this configuration or part of it in new searches in order to save time. The dashboard configuration is very flexible and you can personalize each of the widgets according to your business goals. Furthermore it provides an easy integration with Hootsuite. It has not a native integration with a CRM, so it is not the best solution if your goal is to enrich the data of your client data base, to improve the customer experience or the effectiveness of your campaign automation process. It´s a good tool both for starting the first steps managing the brand reputation based because it is very user friebdly and for going ahead towards complex brand strategies based in share of voice. You have to bear in mind that it is not a cheap one. It is definitely one of the best tools to analyze your brand reputation and obtain dashboards and reports that measure your position related to your competitors. It is very effective and quick crawling the Internet and detecting relevant issues. It has very useful kpi’s and functionalities to communicate alerts. The license´s price is good when required high volume of mentions. "Great all-around tool that's always improving"
Brandwatch's UI is straightforward and makes onboarding relatively easy compared to some other tools. There's something for everybody when it comes to social listening & online media analysis. Brandwatch also has great support, and they're always making progress on their product roadmap. Some of the features/components seem to be less accurate than others, though they've made big improvements to features like Topic Clouds and Sentiment analysis. "One of the best of the best"
Brandwatch gives you all the tools you need to be successful in one place. There's very little that Brandwatch can't do and even then, there's a way to accomplish it on the platform. The other thing is the team itself is very good about helping analysts use the platform better. The only conceivable issue might be the price? Honestly, just posting here because I need to, I don't personally have any issues. I suppose the other could be maybe adding more video tutorials/how-to's on using the platform. At least have the conversation with the team. You never know what might be useful! I solved all of my business problems with Brandwatch. It gives you a very clear picture of what's going on and what you need to know to be successful on the tool. "El poder de la comunicación digital en tus manos y en tiempo real"
Hace unos años pensar en una herramienta como BrandWatch era inimaginable, pensar en que se podrían analizar las conversaciones digitales a cualquier nivel y en tiempo real era reto muy difícil. Hoy es posible gracias a esta herramienta que te da acceso a una nueva era en la comunicación y en la investigación de mercados. Por primera vez podemos escuchar a nuestros clientes y conocer realmente nuestra empresa. Para sacar todo el potencial de la herramienta tiene un nivel de complejidad importante y una curva de aprendizaje de semanas o meses que te obliga a estar en constante investigación y formación. El verdadero potencial de la herramienta está en ser capaz de hacerte preguntas y buscar la calidad de la restaurante a través de la monitorización y la gestión de las conversaciones en BrandWatch. Hazte preguntas sobre tu empresa o tus clients y busca la respuesta en BrandWatch. BrandWath es una herramienta que es capaz de contestar a preguntas que cualquier empresa pueda hacerse sobre sus clientes, su marca, su mercado, su competencia, etc...La investigación de la información digital y de las conversaciones permite acceder a un conocimiento de tu empresa desde diferentes visiones que supone una nueva realidad para el mundo empresarial, nunca antes habíamos accedido a esta información de un forma directa, humana y en tiempo real. Ser capaz de analizar y estructurar esta información en el reto que te plantea esta utilidad. "Most comprehensive social listening tool"
"Powerful analytics tools & visualizatoin features; lacks full coverage of historical data"
The query wizard is particularly helpful to start a query and then customize it to your needs & wants. This saves our team tons of time and provides a very friendly user interface that guides you through a step by step process. I also find the pre-made queries & dashboards (Brandwatch Insights) to be super valuable because they are produced by Brandwatch experts - these often give our team inspiration and guidance to try different query formats/dashboards, etc. Finally, the rules and category feature which enables you to "stamp" mentions in bulk with your own syntax and groupings is powerful and leads to fruitful analysis and deep insights. Lack of historical data; Brandwatch will only store mentions in their archive that were gathered by previous queries. This means that if you want full 100% coverage in historical data, you need to purchase an add-on. We use Brandwatch to quickly gather customer intelligence, spot social trends, identify influencers and learn about industries or consumer groups that we have little previous knowledge about. From a benefits perspective, I haven't encountered an assignment where Brandwatch failed to deliver the social intelligence we sought. "An analysts Tool - Endless Pools of Data to Dive into"
Over my tenure in digital I have had the opportunity to see a number of listening services come and go, their grave error is that while they look nice, they don't provide the utility you pay out the nose for. Brandwatch has always been a tool that allows me to dive into data, with an endless way to shape, cut, and display the data, Brandwatch truly is an analysts tool. Radian6 and other popular tools are for everyday users to develop a big picture, Brandwatch is for the regular digital practitioner who is genuinely interested in protecting reputations, tracking a campaign, etc. Moreover its framework is built in such a way that your results are only limited by your imagination. There are no shiny bells and whistles, it does what it promises and does that each time you ask it to. Ugh, what I dislike about Brandwatch I dislike about most listening programs, their data is generally incomplete. Without proper access to certain data streams all listening services are, in some effect, only taking statistically relevant samples. However, the industry as a whole is handicapped in this way, therefore I can rest assured that the differentiator lies within the UX which Brandwatch has in spades. Its only limits are your imagination (corny but true). "The comprehensive filtering puts the power in your hands"
Brandwatch's strongest feature is the ability to filter your data in (almost) unlimited ways. The filtering capabilities put the power in the hands of the user, who can find the exact conversations worth finding. This feature removes the restrictions other platforms have in only letting you chop up the data their way. If you are a savvy social marketer, you will be able to find unique insights about your topic and audience in minutes. The second best feature? Brandwatch's talented team will gladly help you achieve your goals for the platform. Currently, the geographical audience information is not 100% accurate. Brandwatch has a good roadmap and vision for the future of social media monitoring so I am hopeful that this will be addressed as new technology emerges. As a social media marketer at a marketing agency, I use Brandwatch to find relevant conversations my clients' audience are having about products, services and industry trends. Since Twitter is a firehose of information, Brandwatch allows us to listen to our audience and learn what their pain points are, without having to sift through tonnes of mentions. Combined with the social analytics in the platform, we are able to find unique insights about certain topics and measure them against growth and social engagement for our clients. "Great for analysis setup, but other issues prevent it from real analysis"
Ability to create custom dashboards and segment the data in various ways. Also, there's some ability to integrate other data streams from tools such as hootsuite to pull in that data. The data analysis in the tool is not at all intuitive compared to other social listening tools. To get to real topic segmentation analysis, you're only allowed to go through pages and select up to 100 posts at a time to segment, or mass groups of similar phrases together and call them a topic (but the latter means much less accuracy in topic segmentation). Not too mention historical data can be a hit or miss, now that they charge to get 100% historical data on top of what you pay for their limited amount of mentions. Using the tool as a part of a larger methodology to help predict sales. At it's minimum, it can track social signals, but I can't rely on it for much more than that. "A Valuable Component of our Toolstack"
I like the versatility of Brandwatch. It can be used for many purposes including, but not limited to, crisis monitoring, trend analysis, audience identification and much more. It solves for the majority of my team's analytical needs. I also appreciate the customer support that accompanies the tool - it's top notch especially compared to other solutions in the space. There isn't much that I dislike! If anything, just the occasional glitch. Crisis monitoring, trend analysis and audience identification are the main business use cases. Brandwatch helps us to track what is being said about our company & all of our brands, dive deeper into certain topics, and understand the audience of people who are discussing these topics online. "Very interactive and comprehensible platform"
The platform is very easy to work with. I like the idea of being able to see the sentiments in the form of coloured bars next to the topic when viewing mentions in the form of 'snippets'. I also like the flexibility of being able to change things (date, sentiments, etc) within individual components of the mentions data as well as making changes to the whole data. I also like how accurately the mentions data is pulled minimising the need for data cleansing by the user. The sentiments are not always accurate and when viewing mentions data in a table form, there is no indication of sentiments (unlike the colour bars on the snippets) unless I click on each individual post. Apart from that it would be nice to have a new page opened when filtering data by keywords/sentiments while keeping the original unfiltered data untouched. Currently the changes are made within the same page and it gets a bit difficult to track where the changes have been made. I am looking at conversations within social media where our clients are directly mentioned. I realise that a number of issues within businesses cannot be identified directly unless talking to consumers who have made use of the goods and services of the business, and social media platforms seem to be a portal to identifying areas of improvement within businesses. Brandwatch has an easy to use dashboard layout, that makes it quick and simple to start parsing data (particularly if you're you're not an analytical wizard!) - however what I like best is the collaborative approach that brandwatch take in terms of taking time to understand the business, your ongoing needs and their flexibility in adapting to that. I dislike writing queries, although the continuing development of the query wizrd is making this easier all the time. Benefits include being able to provide real time insight from an incident management perspective as well as feed in insight around wider industry conversations to inform strategy. "Great tool, but poor customer service"
The query is amazing. You can pre-clean the data you are going to get and that assures you to get the mentions related to your topic. That helps saving time and money, because you won't have to delete the mentions and the quantity of mentions are going to be directly related to the theme. The alerts and signals are very helpful during crisis, and I love the alerts by specific author, as there are a lot of different detractors and we can assign the answer to a specific team member, depending on the topic covered. It is really useful for political campaigns. Vizia is amazing during debates or conferences, because we can observe the conversation generated around particular topics and try to defend/develop points of views during the debate, and the team can work on the answers to all the questions generated during the talks and predict other questions that could be generated afterwords. Customer service, billing and Facebook connection. Customer service: we would like to have a better approach to our requests. When the platform lost its connection with Facebook (and it happened a lot) the only answer we got was: sorry, we are working on it. But we lost clients because of the promise we broke, we couldn't get them real time data. On the other hand, they should be more flexible. I understand that they generate annual contract by maximum amount of mentions, but what if we are underusing the capacity? They should charge for the mentions used and not charge the maximum capacity of mentions, mainly because of political campaigns, which have their up and downs. Any changes in contract and billing was a challenge. You can go up, but can't go down. Review the contract and platform limitations (like Facebook access or specific website that could be connected). We were able to prevent bigger crisis by watching closely the audience conversations. It is really useful to create content around different kind of topics we would like to monitor. On the other hand it helps to customer service team, as it keeps track on every mention generated by unique authors. We could see the reach of the mentions generated by different influencers and that helps to direct the campaign depending on the topic that reached the most audience. "The Rolls Royce of social intelligence"
I can always rely on Brandwatch to tell me what I need to know. I can make informed decisions and there's always a surprise waiting for me too. Pure, clean and brilliant intelligence at the touch of a button. It doesn't get much better than that. Sometimes we're not as fast as Brandwatch and we forget to build queries before we need them, I know historical data is getting easier to request and use, but still. The little start-up that made it big. Just meet some of the team and find out about Amy Collins's vision for the product, that should help quash your fears. It's impact stretched beyond MarComms through to Data Science, Policy and Governance. Social intelligence is intrinsic to our transformation, we're just scratching the surface but there's lots to learn. "Amazing social listening and intelligence platform"
The ability to parse social data in pretty much any way you can imagine has no competition. I've used this product at two different companies and would always gravitate toward it first. It's the Cadillac of social tools and it's not for everyone. It also makes training challenging for those who are not as technically saavy. Identifying influencers; discovering customer service opportunities; understanding brand relevance and affinity; competitive intelligence (and this is just the tip of the iceberg). I like the easy set-up and query building capabilities. Good charts and Twitter metrics offered. Brandwatch is a great tool to do social media data analysis. But they have slowed down their innovation in the past couple of years. They have not added substantial upgrade to their features. They have not improved their coverage of existing or new platforms. Its a good tool to do basic data analysis for Twitter and news/blogs. We monitor online reputation. We are able to spot on time PR crisis and negative viral stories about the brand. "The Best Social Analytics Tool Out There"
Customer service: When things to do get a little complicated or if we encounter issues, the Brandwatch team is always there to help at the click of a button. Ease of use: I first started using Brandwatch in 2012 and even as a beginner to the world of social analytics, I found understanding the tool to be fairly straight forward. The learning process has continued since then. In depth analysis - the ability to track and delve deeper into the social conversations surrounding our clients has proven to be invaluable for our line of work. New features: From Rules to Query Wizard, each time a new feature is added, our jobs become much less stressful. Social data from the likes of Facebook can be quite limited - however, this is not a Brandwatch issue, but a Facebook one. Some of the default graphics don't always suit our branding and there isn't a customisation feature. Don't be afraid to call your account manager. They know the product extremely well. Ask questions and use the online support guides. The new Query Wizard is a fantastic addition to those new to Brandwatch's boolean. Helping our client's understand their audience is one of the main pillars of our business. Without Brandwatch we'd be relying on inferior products. "I use brandwatch for social data research focused on voice of customer and industry research." The query functionality is great and provides a lot of operators that can be combined to optimize the search and find the best results. It could be optimized for relevant sources. There's a lot of times that the search brings results with the keywords we want but with tons of sources that are not really relevant in the digital space. Evaluate if you really need Vizia, which is the feature for Command Center. Although really interesting and cool, it won't be necessary for a really good data analysis. Understanding customer feedback, and providing insights to the business aiming to improve the customer experience overall, and also product optimization and development. "Brandwatch is easy to use and provides an effective way of locating large quantities of data. " Brandwatch is user-friendly. The table view gives you a good overview of specific pieces of data. The topic cloud function is helpful for identifying key pieces of data and stories. Links to data (e.g. to specific tweets) are clearly placed, making them easy to access. The data can sometimes take a long time to load and the sentiment function could be more accurate. Brandwatch is easy to use and an efficient way or organising large quantities of data. I would recommend it to others. Brandwatch enables us to collect large amounts of data relating to specific brands and/or topics. The ability to narrow down these large quantities of data by topic through the topic cloud helps us to effectively organise data and produce clear, well-structured research for clients. "User friendly, intuitive product "
Brandwatch is incredibly easy to use, whilst being an in depth, powerful tool. The interface is aesthetically pleasing, and data is displayed in a simple and effective way. My experience with the customer service team has been very positive. For my usage - influencer identification and key word tracking - I have had no problems. If you need an intuitive, powerful tool to identify influencers and give you a wide range of social media analytics, Brandwatch is for you. Influencer Identification - Brandwatch enabled us to quickly and easily access I large number of influencers relevant to our field. Tracking campaign involvement - there are simple ways to track hashtags / key words, to see who has been talking about our campaign. "Brandwatch is an amazing tool for social listening "
I think reporting could be improved, for example, I would love to create a custom dashboard for my clients that they can log into, with prettier and customized visualizations, colors, etc. "Best-in-class social listening tool...So far"
Brandwatch has very advanced boolean operators that allow you to parse and analyze social listening data on a very granular level. Compared to other "social listening products" such as Sprinklr, BW actually allows for proper analysis of social data as opposed to just viewing data on an aggregate level. This allows for deep insights and segmentation of data for proper decision making, especially if you have a newsroom set-up. There's a constant innovation pipeline with Brandwatch that makes the product more sophisticated every year. In some cases, if your brand is very active in social, BW can be structured with proxies that are good indicators of brand and business performance. This not typically the case with other social listening tools that only offer insights and deep enough to measure campaign and program performance. Brandwatch can have a steep learning curve given that it is a proper analytics tool. Boolean operators that are custom to the platform can take some time getting used to. This list keeps getting longer each as its capabilities expand, however, they offer free masterclasses to customers and partners which is an added bonus. Typically as a customer we'd just hire their team of data scientists to help analyze the data if we're in a time crunch. Ensure that you have a proper team of analyst or data scientist on board that can properly use the tool. It's very powerful if you have the right people on your team as opposed to just using it for its basic functions. Buzz monitoring, campaign insights, brand performance tracking. Crisis management. 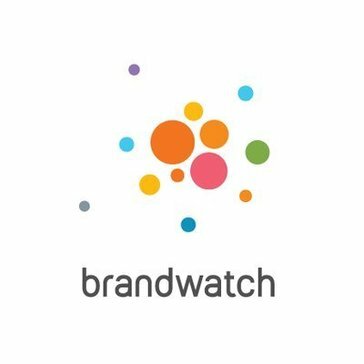 "Brandwatch es la solución de Social Monitoring más completa del mercado." Destacaría como aspecto clave la capacidad de personalización de la herramienta. Brandwatch es muy flexible, lo que permite descubrir la información que necesitas sin restricciones mediante diversas funcionalidades para el análisis tales como filtros avanzados, etiquetas y categorías, alertas, gráficos ad-hoc, análisis de temas, sentimiento, y muchas opciones más de gestión de datos. No se integra como tal con CRM's. Todos las compañías de CRM referentes en el mercado (Salesforce, Microsoft Dynamics, Oracle, etc.) ya tienen herramientas de Social Monitoring y están empezando a integrarlas con el resto de sus productos de gestión de clientes, y eso hace que su potencial sea más elevado a la hora de integrar los datos de monitorización con los datos de los clientes. Detección de tendencias en el sector, monitorización de la marca, análisis de quejas para su posterior actuación, realización de observatorios de la competencia y análisis de información relevante para departamentos de seguridad y prevención de riesgos. "Great software for monitoring your social media and doing research on it"
First of all, the software is incredibly easy to use and the team at Brandwatch are always happy to help if there is anything you need help with or don't understand. We specifically used the software for doing research about discrimination online, and found it easy to create graphs, real-time data and adapt the software in a way that suited us and our needs. The data generated was so good that we could release it to the press and get some good publicity around it, which never would have been a possibility without the Brandwatch tool and assistance from the staff. We needed to do a lot of clean-up around the data generated, to ensure we were getting the correct figures which was time-consuming. But as the details of our research was so specific (looking for abuse aimed at footballers online), this would have been the case with any tool used and we received a lot of help from staff at Brandwatch to ensure we had the most correct data. I would highly recommend it, as I found it easy to use and Brandwatch a very professional and helpful company, with innovation and forward thinking at their core. We weren't solving a problem as such, but wanted to know the scale of the problem of abuse online in football and Brandwatch helped us doing that in a quantitative and detailed way. And the benefits for us was that once our queries had been set up by Brandwatch, it was then easy for us to play around with the figures, updating the queries and accessing the stats that were helpful for us. And I think this is one of the main benefits with Brandwatch, it is user-friendly even for someone who might not have the biggest understanding in the digital field. "The Best in the Game"
Do your research but you will find yourself back at Brandwatch before you know it. Social media listening. What is going on with our client's business and why? The benefits have been that exact thing. I love the capacity to monitor social media channel from way back in the time. The chance to filter in so many different ways, and the full time 24/7 support is algo excellent. Although the system is very intuitive, there's been a couple of opportunities that I didn't save my work and lost it when closing the window. There would be great to have a mobile app or a desktop software. I monitor political Twitter accounts to research mainly on digital diplomacy. BrandWatch helps me a lot in systematizing the information and put it in a way that the general public can understand it. Getting data to people who never consume it, or know we even have it - Vizia has been great for that. * We monitor all Brandwatch reviews to prevent fraudulent reviews and keep review quality high. We do not post reviews by company employees or direct competitors. Validated reviews require the user to submit a screenshot of the product containing their user ID, in order to verify a user is an actual user of the product. Hi there! Are you looking to implement a solution like Brandwatch?